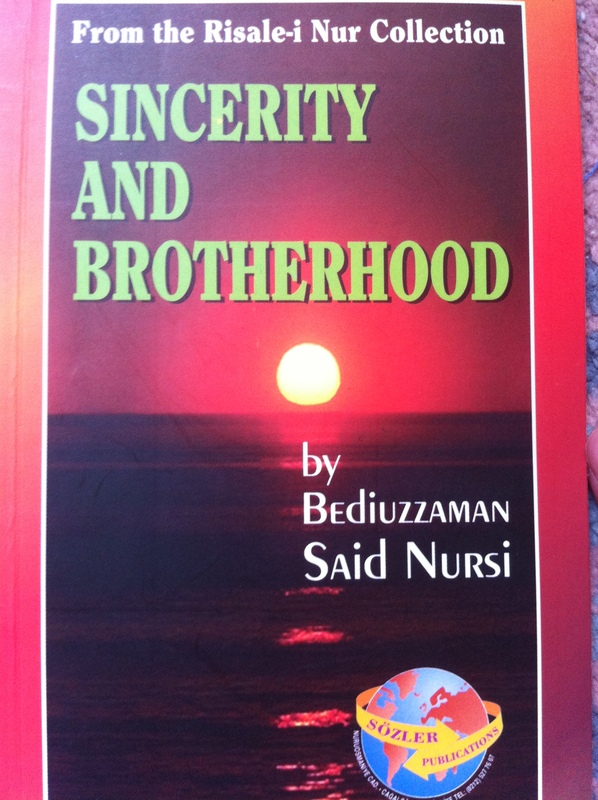 I was handed a neat little booklet titled “Sincerity and Brotherhood” not too long ago. It was all in English, and claimed to be from Said Nursi‘s Risale-i Nur Collection. Having just been implored by a Turk to read Nursi in English rather than Turkish (significantly better, in his opinion), I was delighted to run across the booklet. And so, on yet another unpleasantly long bus ride (not an uncommon phenomenon), I began to read some Nursi. It was not at all what I expected. One thing was made clear to me from the outset: Nursi is very political, and very much a product of his times (late Ottoman Empire). There are two parts in the booklet: One on “Sincerity” and one on “Brotherhood.” But they really aren’t about sincerity or brotherhood—they are about how sincerity and brotherhood are instrumentally useful for delivering Muslims from their humiliation and disgrace as a civilization. In fact, the whole booklet reads like an apology for the collapse of Islamic civilization. The agreement among the people of misguidance is on account of their abasement, and the dispute among the people of guidance is on account of their dignity. That is to say that the people of neglect – those misguided ones sunk in worldly concerns – are weak and abased because they do not rely on truth and reality. On account of their abasement, they need to augment their strength, and because of this need they wholeheartedly embrace the aid and co-operation of others. Even though the path they follow is misguidance, they preserve their agreement. It is as if they were making their godlessness into a form of worship of the truth, their misguidance into a form of sincerity, their irreligion into a form of solidarity, and their hypocrisy into concord, and thus attaining success. For genuine sincerity, even for the sake of evil, cannot fail to yield results, and whatever man seeks with sincerity, God will grant him it. From this excerpt, it is not entirely clear what “attaining success” means, but it seems to me that Nursi is speaking of imperial power—the imperial power that has been lost by the Ottoman Empire and gained by the godless Europeans. What surprised me was that, immediately before explaining the success of the “people of neglect,” Nursi accuses them of being “sunk in worldly concerns.” In order to avoid calling Nursi a hypocrite himself, we can only assume that imperial power is either (1) not a “worldly concern,” or (2) a “worldly concern” that only Muslims are allowed to have. The implications of this view—if it has been conveyed to me accurately by this booklet—are enormous. From the man who is regarded as perhaps the most notable Turkish-Muslim Sufi in history, this is not what I was expecting. There are multiple—primarily inaccurate—interpretations of what “Turkish secularism” means. I have intended to post about this in the past, but I have never run across a clear explanation of the phenomenon to cite. What makes the effort even more difficult is that the meaning of “secularism” in Turkey is changing. This post is merely an effort to lay the groundwork for further analysis if, or when, I manage a fuller, more concise understanding. The Turkish state’s position on religion (laiklik) is more accurately translated as ‘laicism’, the subordination of religion to the state, than secularism, a separation of church and state. The term ‘secular’ is used here to refer to a non-religious identity or one that consigns religious beliefs to the private, rather than public, realm. The laic state controls the education of religious professionals and their assignment to mosques, controls the content of religious education, and enforces laws about the wearing of religious symbols and clothing in public spaces and institutions. The important thing to understand is that Atatürk’s reforms favored French secularism (laicism) to American secularism. Given Turkey’s Ottoman past, this made sense—Islam had been the state for centuries and it needed the harsher French approach to amend the situation. Atatürk clearly wanted to do to Islam what the post-revolution French did to the Catholic Church. This, I think, is the historical charm of the AKP. If nothing else, the current rule of the AKP is a symbol of a maturing secular state. It remains to be seen whether they can restrain themselves in this regard, or if this is a transition to a less apologetic, more religious, government. I picked from the library’s bookshelf, several months ago by now, this short volume by Arnold Joseph Toynbee, titled Turkey: A Past and a Future. Taken in context (1917), it’s somewhat interesting—though my sentiment might change if it were any longer than it is (it’s a delightfully short read). Turkey, which claims the present in Western Asia, is nothing but an overthrow of the past and an obstruction of the future. Both times I heard it, it was indicated that it was quite the ubiquitous expression. Yet I’ve still only heard it twice. Perhaps this is merely a testament to the fact that I haven’t spent enough time in Turkey. Or perhaps it’s just not the kind of thing you hear in the teahouses. Seeing the phrase, one has to wonder how many Turks believe it. Or, more interesting, how many among those who believe it think that the rule of the AK party satisfies it by constituting a religious government. Is the secular nature of the state somehow ameliorated by the presence of an Islamist party? Even more interesting—how many Muslims believe it? To a Muslim with literalist tendencies, God did not reveal Islam in order that it be a “religion.” Rather, Islam is a dīn—which is better described as “religion together with its practices in general.” Part and parcel of this dīn is a certain form of governance, and the AK party; according to the literalist, certainly doesn’t fit the bill. As Turkey reintroduces itself to the Muslim world, it reintroduces itself to the kind of criticism that it endured from such literalists during the Ottoman era—that its brand of Islam is not the Islam given to man by God (ironically, later critics said that the Republic of Turkey destroyed Islam by abolishing the Ottoman caliphate). Today’s AK party, which has been called neo-Ottoman on many occasions, takes up the gauntlet once again—this time as an aggressive salesman (call them Ottomongers) to the victims [?] of the Arab Spring. Whether the Turkish model will ring true on the Arab market remains to be seen. Yeah, I don’t think it’s likely, either.